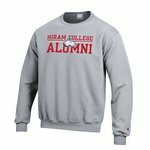 Champion Reverse Weave is the quintessential collegiate garment. The heritage of this iconic product reaches back 78 years and continues to be not only relevant, but has gained popularity both on and off campus. The combination of versatility and durability has made Champion Reverse Weave a favorite of athletes on the field and around campus for generations. Champion Authentic athletic crew sweatshirt.